IG Karabagh is a German group which promotes, imports and breeds a variety of horses from the former Soviet Union. The Akhal Teke, Karabakh, Tersk and well represented by members, and information on lesser known breeds is provided on their informative and well-illustrated website. The site is in German, but there are plenty of pictures and links to browse. For a quick orientation, "Zuchter" is a list of breeders, with links to their sites. "Deckhengste" is stallions at stud. "Verkaufspferde" is horses for sale. And "Pferderassen" is a directory of old Soviet breeds, with further links and photos. Besides the Akhal Teke, few if any of these breeds are found in the US. 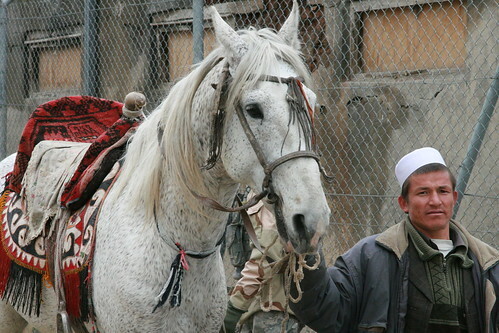 Another interesting source for information on the Central Asian breeds is The Turanian Horse Website, which has many pages of interesting articles and photos featuring the Turkoman, Akhal-Teke, Iomud and other lesser-known types of horse. This site is in English. This is a neat find: footage of the Akhal Teke stallion Absent, from the 1960s. He was famous in dressage, and one of the most widely recognized Akhal Teke horses. Note in this video the sheet of newspaper that blows into his legs at the end, and he pays no attention at all.